My dad fondly (or at least I will continue to perceive it as fondly) refers to me as “my son, Caroline,” not in a Bruce Jenner type of way (or at least I will continue to perceive it as such) thanks to my incredible brute strength and burly, ruddy, handsome features. As such, I am typically just a phone call away (thanks to my amazingly people pleasing nature, of course) to help move furniture or heft other inanimate objects. Last Thursday the project was moving an old grill off the porch. Fast forward 86 hours, significant bruising, a sure-to-be-lost nail, swelling, pressure and a very modelesque limp, and Davey the Hubbers urged me to get it checked out. Looks like my prophesy of blood poisoning (and subsequent gift showering… huzzah!) may be all too accurate. I hauled my chickadee with me to the Minute Clinic where the nurse practitioner took one look at my distorted foot phelange and ordered me straight to doctor. She used words like “systemic infection,” and “much too bad for me to diagnose.” On my way out I limped to the cooler for a Diet Dr. Pepper (the elixir of life), and off we went. The doctor we saw did indeed diagnose it as a systemic infection (that sounds so Ebola-chic! ), prescribed antibiotics and that was it. A very anticlimactic end to a much built up story. But that’s about as eventful as life has been lately. And I’m still waiting on that barrage of presents. Dad. Except for what we’ve been eating this week! I’ve spent the past few weeks using a majority of new recipes with mixed results, so this week I fell back on some tried and true friends. Spicy Chicken Baked Tacos – Yum. Reheat these in the oven vs. the microwave to maximize the crispiness. Also, there are regularly coupons floating around for Old El Paso taco shells, and the crunchy Stand ‘N’ Stuff version is great for these. Crispy Pork Ramen – Per the husband’s request. Literally any week I ask him what he’d like to see on the menu he says, “Ramen.” “Fiesta Chicken.” Easy to please, that one. 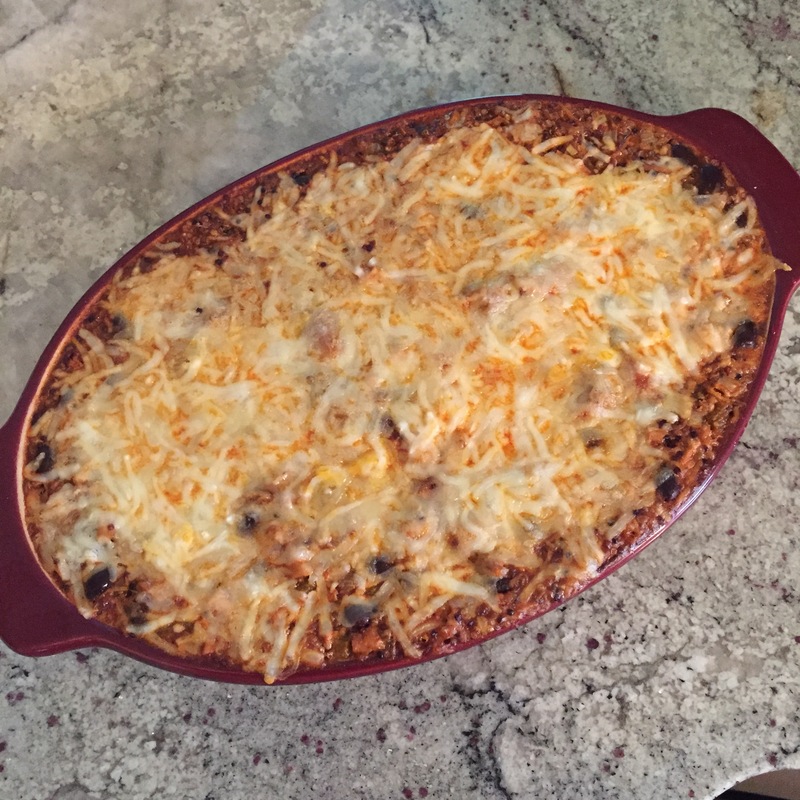 Chicken Enchilada Quinoa Bake – Davey is not a fan of quinoa as a general rule, but he mentioned several times how much he enjoyed this dish (pictured above). Plus it is hella-healthy and hella-inexpensive. To me, triple win! Cuban Sliders – I love this recipe because it gives me more than one meal – the pork is delicious on its own with rice and vegetables, and the sliders fed us for lunch and dinner and another lunch.